170 pages | 8 B/W Illus. 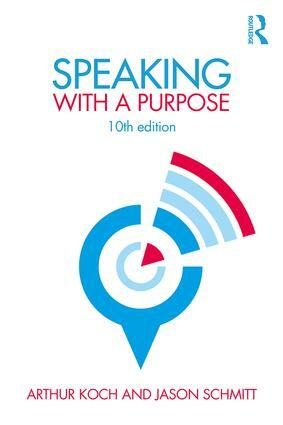 Now in its 10th edition, Speaking with a Purpose is designed to help speakers develop the skills they need to prepare and deliver effective speeches. Based on a traditional step-by-step approach combined with up-to-date communication theory, this no-frills text allows students more time to prepare, practice, and present speeches. This edition includes two brand new chapters, both with a technological focus. Students and instructors can also enjoy updated online ancillary material with resources for each chapter. This text is a valuable resource in the traditional, online, or hybrid classroom. "When I went off to college my father gave me just one piece of advice: Learn how to speak in public. How correct he was! But I wish I had this book to help me learn the art and science of public speaking much quicker!" Arthur Koch taught Speech and Communication at La Crosse State University, University of Wisconsin-Milwaukee as well as Milwaukee Area Technical College where he served as department chair. Jason Schmitt is Associate Professor of Communication & Media at Clarkson University in Potsdam, New York. He is a regular columnist for Forbes and Huffington Post with a focus on new technology evolving higher education. To gain access to the instructor resources for this title, please visit the Instructor Resources Download Hub. You will be prompted to fill out a registration form which will be verified by one of our sales reps.